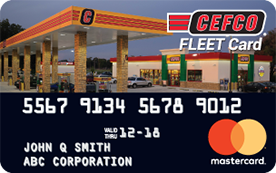 The CEFCO Fleet Card is not your average fuel management program. Fleet managers can see and control card usage online with easy 24/7 access and reporting to better manage expenses, while also reducing fraudulent purchases. Accepted at over 230 CEFCO locations, fleet managers benefit from convenience and exclusive discounts on fuel purchases, with monthly rebates on gasoline or diesel purchases. Gain more peace of mind, knowing your drivers are only using your CEFCO fleet card on authorized purchases. Set prompts to ask for vehicle or driver number prior to purchases. Fleet managers can also shut off lost or stolen cards at any time, with real-time account information available 24/7. Today’s businesses are making the move to digital – so should you. With the Online Card Management feature, fleet managers can set individual card usage and spending limits by day, week or month. Restrict purchases during off hours and add or delete ID numbers. Keep your operations secure and efficient with easy access from anywhere. *Rebates are based on the customer billing cycle and are cents per gallon for gasoline and diesel purchases at CEFCO locations. Credit will appear on your statement. Subject to credit approval and applicable law. Rebates are subject to change without prior notice.